It is important to understand how the ICB exams work before you can consider your results. You need to understand the process involved in taking an ICB Exam. This covers everything from registration, when you will be writing, and more. The first thing you need to understand is how your marks and assessments work. There are two kinds of assessments that you will deal with as an ICB student. Formative Assessments and Summative Assessments. Summative Assessments are quite simply the exams that you will write at the end of your studies. Formative assessments are the assignments, exercises, and practical work that you do throughout your studies. Some of these will count toward your final marks at the end of your course. The Portfolio of Evidence (PoE) that you receive at the start of your course will show you what needs to be included. Everything that is included in your PoE will count toward your final mark. This is your workbook. You need to include all the documents you are instructed to into your PoE. You will then hand your PoE in when you arrive at your exam venue. To make sure you get as much time as possible to work on your PoE you should register for your exams as soon as possible. This is because you will only be sent your PoE once you have registered for your exams. To register for your exam you will need to pay an assessment fee per subject that you intend to write. This exam fee changes every year but at the time of writing this article, you will be paying R350 per subject. So if you are registering for four subjects you will pay a total of R1400 for your exams. These fees will normally be paid to the ICB and not your college. This is because the ICB is an external examining body. Some colleges might include this fee in your course fees so you should check and make sure. You can also use the ICB Learner Portal to register and pay online. You can look online for more information about the ICB Fees as well as finding the ICB Fees brochure. Before you can make use of these functions you will need to register on the ICB Learner Portal. There are four opportunities for distance learning students to write exams. These are in February, May, August, And November. It is important to make sure when your subject will be written, by when you have to be registered for the exam, and when your results will be released. You can look below for all of this information and more. Skills Academy has all the 2019 ICB Exam dates online as well as where you can find the exam timetables for both classroom and distance learning students. Due to how the ICB works, they don’t have a single or centralised venue where you write exams. There are many different exam centres across the country. You can find the full list of venues and a map which shows you your closest exam venue on the ICB website. 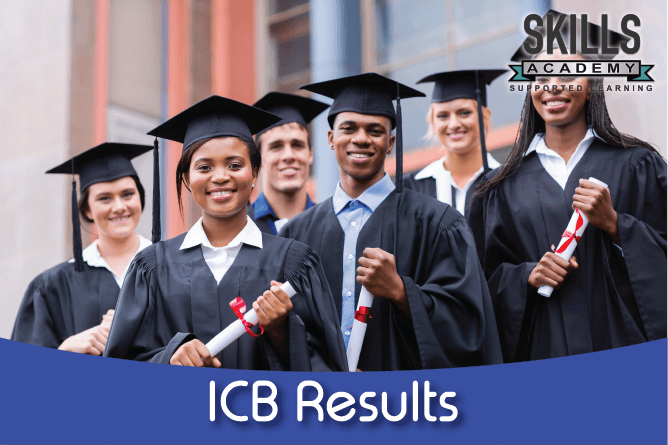 How you get your results will depend on how you are studying your ICB courses. If you are a classroom learner you will need to go to your college to collect your results. Your results will be sent to your college on the day they are released and you will need to contact your college to get your results. If you are a distance learner there are two ways that you can get your results. You will either need to wait a day or two after the results are released for the results to arrive via email or you can log on to the ICB Learner portal to find your results. Your final mark is calculated from a combination of your Portfolio of Evidence (PoE) and your final exam mark. The PoE forms 30% of your final mark. Your final exam completes the other 70% of your final mark. To pass your exam you will need to get a mark of 50% or above. However, to pass your course you will need to get a combined mark of 60% or more. So if you add your PoE mark and exam mark together you will need to get 60% or more. Below you can see a simple explanation of your marks. What can you do if you Think Your Marks are Wrong? If your marks are not high enough but you think there is a mistake, you can have your paper remarked. To do this you will need to apply for a remark within 30 days of your original exam. To do this you will need to download the Application for Re-mark of Exam form, complete it and send it in. You will also need to pay an additional Exam Re-mark & Examiner’s Report fee. This fee changes every year so you will need to make sure you know what the latest fees are. After you have done all this you will need to wait for up to 28 days to get your results back. These results are final and cannot be remarked again. What can you do if you Fail? If you get your ICB results and they say “Not yet competent” you can re-write your exams. However, you have only one chance to re-write your exam. You can apply for a re-write by filling in the exam re-entry form and pay the re-write fee. As with the remarking fee, this fee can change so it is important to make sure you have the latest fees information. You will need to re-write your exam within 12 months of your first exam. It is a good idea to do it as soon as possible. This is because the ICB courses are revised every year. If your second exam mark is high enough you will be marked as “Competent”. If you don’t pass the second exam you will have to redo the course again. Whether you want to register for a course or if you are already a Skills Academy student who wants to get help with their ICB results, you can call Skills Academy toll-free on 0800 39 00 27. Our consultants will be able to help you today!